You stated: "In fact, they may never be the elect, if they never do what they are commanded to do." Calvinists, such as yourself believe that God CHOSE His Elect before the foundation of the world. Yet, you basically you stated that certain unbelievers may NEVER be part of the Elect if they never do what they're commanded to do[/B] Do you see the discrepancy here? The reason being, if God CHOSE His Elect before the foundation of the world according to His Sovereign Will, there would be NO "may never or if they never do what they are commanded to do." Jesus said the Way was narrow, and few would find it "before' an Open Theist became a Christian. I'm having a dilemma with your dilemma. Do you see it? Thank you. It sounds as if you're saying, in order for them to become one of the Elect, they need to do what they're commanded to do, therefore, THEY need to do something. However, the do something or NOT do something, requires a 'free-will' to choose to do something or NOT do something. You stated: "at the appointed time the elect inevitably shall, of their own free will, call upon the name of the Lord and be saved." The problem is IF God CHOSE the Elect before the foundation of the world then, how can you say: "at the appointed time the Elect inevitably shall, [B]of their own free will, call upon the name of the Lord and be saved. After all, IF God CHOSE His Elect, how can they use their 'free-will' to make a choice, either way? Calvinists say that 'God CHOSE His Elect by His sovereign Will.' Do you see the problem with what you stated? Agreed that such is difficult. I try not to use 'own free will.' Rather, I believe God's will "overshadows" and enables. His will becomes our will and we rather 'surrender' our wills. Is it a 'free' choice? I don't like 'free' when trying to discuss aspects of will. Why? In Matthew 6:24 implies we never have a 'free' will. It means, for me, that 'free' is an awkward descriptor, at best, at least for me. Doesn't Matthew 6:24 imply that we have, already, one of two masters? I know there are Open and Calvinism ideas interplaying and perhaps not connecting that may have some distractions, but I hope there is some meaning here. You stated: "Election unto salvation may take place in eternity, but the declarative judgment of God, one's justification, and imputation of Our Lord's righteousness to us, takes place at a time and place. Prior to that time, all elect remain under the wrath of God." You will have to explain FURTHER on this one? Difficult for me too, specifically because time, for us, is always a factor (or nearly so) in our explanations, illustrations, and examples thus we have no easy way of discussing extemporal matters. Everything we understand is about stuck in such a quandary. How DO you explain red to a blind man, by example? You may have beautiful adjectives, but he/she is really at the mercy of inadequate words. For me, this is much like describing God beyond our ken. He gives us inklings, beautiful inklings. Jesus is an entirely different story. If you are using the free agency paradigm, God does not (cannot not) guarantee what anyone will do before they are born unless he is willing to shape events to make it strongly likely, and then if it comes down to the person being ultimately resistant, being willing to "harden their heart" and make them take an action. God had to harden Pharaoh's heart for example, or else he probably would have relented in the face of overwhelming force. And although God can make someone take an action, if he makes them do it, he is the one ultimately responsible. God could make someone do entirely righteous acts with mind control, but it doesn't make the person any less sinful. Likewise I could chain up a murderer so he wouldn't ever move, but he still has murder in his heart. So when we consider Jesus, how can you predict that the Lamb will be perfect and without sin, and not be playing a cosmic gamble against all odds that your Messiah will make a mistake? It isn't enough to mind control, and perfect in this sense also means the heart. So how does he make this prophecy? There's a saying, if you want something done right, you do it yourself. That's one of the arguments I've used against Unitarianism... but I realize now that if someone denies free moral agency or they have a "outside time" idea of reality, it doesn't have any teeth. It only makes sense to an Open Theist, I guess. ... so, did I misunderstand why that verse was included in the list? Or did I answer that one well enough? If there's more, maybe we could narrow them down a little bit to make the answer(s) manageable. Last edited by Rosenritter; September 13th, 2018 at 10:47 PM. Reason: Missed a crucial not, fixed it. I disagree. I don't see it as God being the maker of a hard-heart, but rather using the hard-heart for a needed end. There are no 'black pawns' according to God's original intent. Rather, black pawns can be used when God is trying to make something happen. I believe, however, that the reason this particular passage was used, was because Mary was given an elected name, Jesus was elected as Savior, and being saved is an act (election). I disagree. I am one who was 'entirely sinful' or at least as you suggest not 'any less sinful.' God, in fact, did make me less so in my everyday living and entirely in my new nature. Did God 'make' me take actions? You bet He did and I'm forever grateful. He has deliberately stopped me in my youth from making 'my own' rash decisions simply by providing a verse in my devotions that day or the previous. So when we consider Jesus, how can you prdict that the Lambe will be perfect and without sin, and not be playing a cosmic gamble against all odds that your Messiah will make a mistake? It isn't enough to mind control, and perfect in this sense also means the heart. So how does he make this prophecy? There's a saying, if you want something done right, you do it yourself. Not sure what you mean. I don't deny free will, I just don't believe it is a gift from God. We ARE responsible for it, but I think we obtained it ala Genesis 3. My desired effect was that 'election' would be seen as a biblical word from this point in the TOL dialogue. It was both an invite to recognize some commonality as well as an opportunity to talk of differences but the reason I brought it up, is because sometimes those against the Calvinist idea of election, go too far and forget that it isn't a choice. Election IS a biblical word and so an Open Theist better talk about it AND embrace it too. Just like a Calvinist? No, but I think dialogue is more important than dismissal of a biblical term. Many also miss that "Almighty" (Omni- potent) is also a biblical word, including a couple of Open Theist pastors who should really know better. I want to tell them "Talk about those Biblical words! Don't deny they exist in the Bible!" We both realize that our interpretation of certain Scripture verses will NEVER coincide. So, if it's all the same to you, I'd rather avoid this sort of debate. I'll do this, pick one of those verses you posted and give YOUR interpretation, and I'll give my own interpretation. Okay? When a Calvinist shares the Gospel with an unbeliever, can they tell that person that God loves them? Can they tell them that Christ died on the cross for their sins? Can they tell the unbeliever that, if they place their faith in Christ's finished work on the cross, they can become a Child of God and a member of the Body of Christ? How does a Calvinist KNOW if they're a member of the Elect? 1) By their good works? 2) Being a member of a church? An unbeliever can do these things, as well. Does that make the unbeliever saved or of the Elect? Does the Calvinist KNOW they are of the Elect, because of a feeling or emotional experience? What can a Calvinist show the world that they are TRULY a member of the Elect? Does the Calvinist believe that God must first regenerate one who is Elect, then, gives them the faith they need to believe? Is that the order? Does the Calvinist 'put the cart before the horse?' Does the Calvinist believe that the 'Spiritually dead' cannot respond to the Gospel unless they are a member of the 'Chosen Elect?' Do ALL Calvinists believe in the TULIP system? If a Calvinist KNOWS they're of the Elect, must they live their life accordingly? Can an 'Elect' backslide or lose their position as being one of the Elect? No. It is just ancient silliness. Was Humpty Dumpty a Calvinist? Interestingly, the reference to Humpty Dumpty to make this exact point has been made in several legal cases, including two Supreme Court cases. 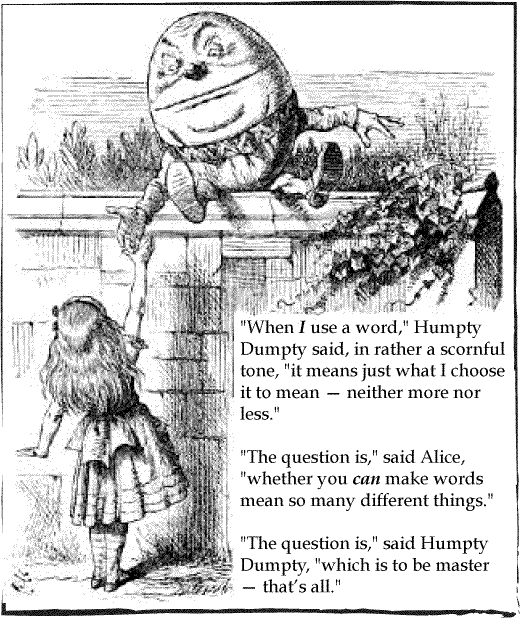 It is clear that the interaction between Alice and Humpty is intended to teach this very lesson; that words mean things and that if you go around arbitrarily redefining their meaning, the result is meaninglessness. The story clearly applies to the "impenetrability" of the Calvinist's mind. From the beginning of creation, as far back as we know, of his own free will..
... God ordained that men and angels shall also have free will like Himself, and that as such has given them permission and license to exercise their will within the bounds of his creation, knowing and ordaining that these creatures shall change what comes to pass. He shall not change his decree that his free-willed creation shall be tried and tested. God recognizes that these creatures might sin against him, but he does not wish or force this upon them, but calls them to obedience and repentance. The only confusion comes in where the Calvinist disagrees as to what God has ordained. "...nor is violence offered to the will of the creatures; nor is the liberty or contingency of second causes taken away, but rather established." The inclusion of these phrases tells you what is meant by, "unchangeably ordain whatsoever comes to pass". It is the author anticipating the obvious objection. It is intentionally presenting a so called "antinomy". It's a contradiction, the resolution of which is both not sought and not permitted to be sought. It is to be taken on faith that both things are true. In fact, I have encountered many instances where it is precisely the existence of the contradiction that makes the doctrine appealing. "After all,", they say, "one ought to expect there to be unsolvable mysteries and unfathomable concepts when discussing God." It is their willingness to accept the irrational as truth that they count as faith and piety. Whenever you encounter this, you know that you are talking to a lost cause and that no persuasion of the person away from these doctrines is possible. They have literally taken leave of their senses. (21) And the LORD said unto Moses, When thou goest to return into Egypt, see that thou do all those wonders before Pharaoh, which I have put in thine hand: but I will harden his heart, that he shall not let the people go. I believe (note that I limit this word to believe) God will not harden anyone's heart in a south direction that wasn't there already. God didn't have to harden Pharaoh's heart initially; it was after Egypt was receiving divine smack-down and any sane ruler would have relented, not out of love or understanding but simply acknowledgment of brute force. But three times it repeats that God was to harden that heart, and for the reason to stop him from letting Israel go ahead of the schedule. Without that specific intervention Israel would have been let go sooner. My understanding has no problem with names being assigned to people. God only need to direct the mind of the parent to the proper name, either subconscious (which would be hard to prove) or even in the direct obvious sense as in John ("... and wrote, saying, His name is John. ", Luke 1:63). Were you willing to let God direct you? I don't think it takes much argument that throwing a select bible verse in front of someone is not normally expected to have any sort of effect. If God had to manifest himself or an angel in front of you and force your action against your heart and you still resist, the sin remains in your mind, even if the action was never completed. God can direct the naming of a child, he can shape events to place the child in the right circumstances, and if required he can force the action to complete the prophecy. King Saul is an example where God had to step in to actually stop Saul from taking action. Is it not written, "Is Saul also among the prophets?" (18) So David fled, and escaped, and came to Samuel to Ramah, and told him all that Saul had done to him. And he and Samuel went and dwelt in Naioth. (19) And it was told Saul, saying, Behold, David is at Naioth in Ramah. (20) And Saul sent messengers to take David: and when they saw the company of the prophets prophesying, and Samuel standing as appointed over them, the Spirit of God was upon the messengers of Saul, and they also prophesied. (21) And when it was told Saul, he sent other messengers, and they prophesied likewise. And Saul sent messengers again the third time, and they prophesied also. (22) Then went he also to Ramah, and came to a great well that is in Sechu: and he asked and said, Where are Samuel and David? And one said, Behold, they be at Naioth in Ramah. (23) And he went thither to Naioth in Ramah: and the Spirit of God was upon him also, and he went on, and prophesied, until he came to Naioth in Ramah. (24) And he stripped off his clothes also, and prophesied before Samuel in like manner, and lay down naked all that day and all that night. Wherefore they say, Is Saul also among the prophets? I refuse to dismiss any term that is from the Bible text. I don't think Calvinism has a right concept of election, which goes back to the "outside of time" theory of reality. As touching that point, what I was trying to show here is that (at least so far that I have seen) any and every recorded miracle works within the power of God and by the power of God, rather than requiring "foreknowledge" of the "I saw the future in a crystal ball" variety. Meaning, "outside of time" is not required to believe the Bible as written. If you didn't place a big "if" (which could never be known for sure until judgment day) you wouldn't be telling the truth as you understood it. God the Son, the Creator Himself, became a human being and willingly allowed Himself to be hung on a tree where He died. He spent three days in the grave after which He, by the power of God the Holy Spirit, rose from the dead. If you get this one thing right, whatever else you get wrong cannot overcome the blood of Christ. You may make it "by the skin of your teeth" as Job described his escape from his enemies or, as Paul put it in I Corinthians, "as if by fire" but that's better than the alternative. The difficulty is in knowing just what any of this means in the mind of any particular Calvinist. What, for example, does it mean to the Calvinist who believes God to be immutable, that God became a man? What does it mean to the Calvinist who believes that God cannot change in any way whatsoever when God says, "I am He who lives, and was dead, and behold, I am alive forevermore." - Rev. 1:18? For many Calvinists, I don't know the answer to that question! I mean I know what many of them have said it means but what they say makes no sense and I can't read their minds and so, as a result, with only the rarest of exceptions, I leave that judgment up to Christ who knows the hearts and minds of all men and is the Righteous Judge of all things. I strongly suspect, however, that most of the people who call themselves Calvinist believe it the exact same way that you and I believe it and they make no attempt to reconcile it with the doctrine of immutability or with any other Calvinist doctrine. They believe it and, as compartmentalized as it may be away from the rest of their doctrine, that belief is, in my view, an acceptance of the gospel. Calvinists seem to be quite certain of their 'Election.' I would tend to wonder why they would be so positive about their standing before God? Unless like those who have assurance from 'hearing the Gospel and placing ALL their faith in Christ as their Savior.' However, the Calvinist doctrine would deny the 'free-will choice' of humanity and believe that one must first be 'regenerated' then, receive the faith to believe. In other words, Calvinists do not believe that humanity has the ability to place their faith in Christ, because, faith is given to ONLY the Elect, chosen before the foundation of the world.